Does anyone know how to program the MAKERbuino so that a PC would recognise it as a gamepad? I don't think this is possible because the Makerbuino uses the ATmega328 microcontroller, this doesn't support a direct link to the PC via USB. (The Makerbuino is basically an Arduino Uno without the interface chip). 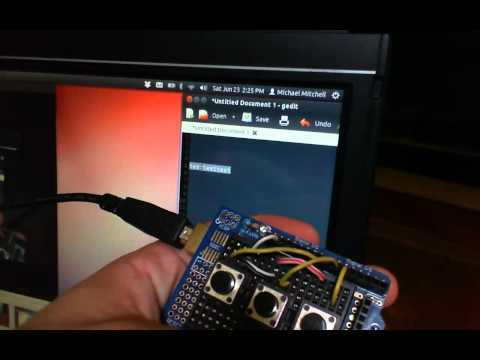 I've not done this myself, But It is how ever possible using an Arduino Leonardo board, as this board can be setup to emulate a USB keyboard or mouse. You could use the Makerbuino to send the commands to the Leonardo board, to which this would control your PC. This website which also explains how this can be done too. There's a workaround, since there is an I2C port. You need to design another board which will make the transition between I2C and USB. That's a nice little project to do. Maybe I will someday. In fact I prefer stm32 microcontrolers. It's just I struggle getting USB code working. Hey, thank you for joining the topic! I don’t think this would work as the UNO is using a different USB-TTL chip compared to MAKERbuino. The reason behind that is that UNO’s USB-TTL converter can be reflashed with Unojoy’s custom firmware whilst MAKERbuino’s chip cannot be reflashed (it’s not a programmable microcontroller).